A man sought by authorities in the shooting of a Fulton County deputy is in custody. Jeshua Gilmore, 18, was arrested Aug. 1 and is in custody. The sheriff says he fired four times at Deputy Simon and his K-9 July 31 as he fled from his vehicle. Working on a Crimestopper tip, Toledo Police arrested Gilmore without incident around 3 p.m. Aug. 1. He is lodged in CCNO in Stryker pending a court appearance at a later date. Deputy Simon responded to the call around 9:32 p.m. at the Country Corral, 7910 State Route 109. Simon approached the vehicle in question when the driver of the vehicle fled and Simon pursued along with Delta Police. The vehicle started having mechanical problems north of SR 109 and slowed to a stop, a press release from the sheriff stated. Simon exited his vehicle along with his K-9 and started toward the suspect vehicle. A passenger fled into a cornfield, the driver opened his door to exit as he was doing so, fired at Simon and his K-9 four times, striking the deputy twice. The suspect then fled into the cornfield. A female passenger, Skye Thibodeaux,18, who had run into the field came back out and surrendered. 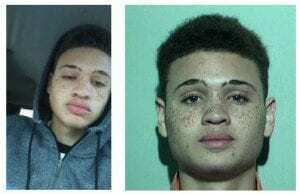 The driver, Jeshua Gilmore, 18, has a felony warrant out of Fulton County for five counts of grand theft, three counts of theft and two counts of receiving stolen property. The area was searched by helicopter from Monroe County Sheriff’s Office, and the suspect was not located. Authorities continue to search for the suspect. Deputy Simon was taken by Life Flight to a Toledo hospital with nonlife-threatening injuries. The investigation continues, BCI from the State of Ohio will be investigating and the Fulton County Sheriff’s Office will be assisting. Sheriff Roy Miller thanked the public for their help in apprehending the suspect. Thibodeaux was booked into CCNO for obstructing justice and obstructing official business. The Fulton County Sheriff’s Office was assisted by the FBI, BCI, the U.S. Marshals, Toledo Police Department, Bureau of Alcohol, Tobacco and Firearms, Northwest Ohio Violent Crimes Task Force, Lenawee County Sheriff’s Office, Monroe County Sheriff’s Office, MAN Unit, Wauseon, Delta, Fayette and Swanton Police, Ohio State Highway Patrol, BCI&I, ALS2, Lyons Fire & Rescue, and Life Flight. © 2017 – 2018, James Pruitt. All rights reserved. Be the first to comment on "Fulton County Sheriff, BCI Apprehends Suspect In Shooting Of Deputy Simon"